Overall, it's a pretty nice list- I think there's a general thought process that goes on in the mind when you read through something like this. You know, 'Why the hell's that there? Where's -fill in name of obscure band-' I always hear so much of that kind of stuff whenever music game track lists are released. Just try to look upon the info after the break with a kind eye won't you? 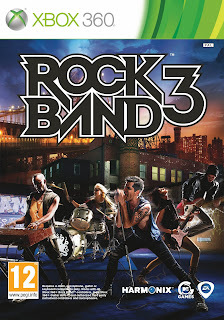 Mtv has done a really nice job with the Rock Band series and I think they deserve a little slack. And the 'by decade' breakdown is awesome- while we're on the subject of rock by the decade, there's not nearly enough 70s and 80s stuff for my taste... just sayin'. Harmonix, the world’s premier music video game developer and MTV Games, a part of Viacom’s MTV Networks (NYSE: VIA, VIA.B), today confirmed the entire 83 song on-disc soundtrack for the highly anticipated Rock BandTM3 music video game, including new tracks from Jimi Hendrix, Avenged Sevenfold, Paramore, The White Stripes, Jane's Addiction, Phish, Anthrax, The Cure, Bob Marley, Def Leppard, Ozzy Osbourne, Dire Straits, The Smiths, Foreigner, Lynyrd Skynyrd, The Doors and many more. Rock Band 3 will be released Oct. 26 in North America and Oct. 29 in the rest of the world for the Xbox 360® video game and entertainment system from Microsoft, PlayStation®3 computer entertainment system, Nintendo WiiTM and Nintendo DSTM.